There were a few cool days last week and I was able to drag myself out into the garden and give the vegetable beds a once over (in spite of the dry soil and high pollen counts). I think it looks as good as it gets, and with all the unintentional flowers it may be fancy enough to call a “potager”, as Annette from Annette’s Garden once called it. I like the name and it’s stuck. It has just enough Continental refinement to make me laugh a little when I look at the plastic fencing, weedy sumacs, chainlink and neighboring industrial park! 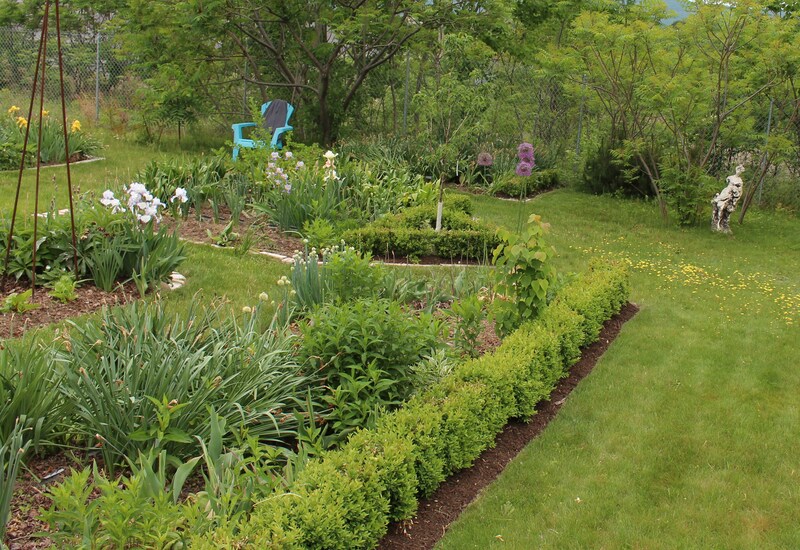 The potager with neatly edged beds and way too much disorganization. By now the warm weather vegetables should already be in but with last week’s frost I’m kind of grateful for my procrastination. The work always goes faster with a good helper or two, but studies have shown that nine year old boys don’t typically fall into that category. Still the company is welcome. A few edible things are starting to fill the beds but I’m always proudest of the fancy pink marble edging which line the plots. In a former life the stone accented the front of the house, but now it helps edge the beds. The look has been called “deep south cemetery” and I’m sure that’s a compliment. Ok, so even freshly weeded it’s still kind of messy, but I’m far too proud of the crisp edge along the lawn and the freshly mulched boxwood to let that keep me from posting a photo. Our little Queen of the Prairie” must agree. She overlooks the potager but has seen better days as the weather continues to eat away at her plaster self. Might be time to start hitting the estate sales to find a successor. A very rarefied boxwood edging lines the outer perimeter and I think it really elevates the standing of my hodgepodge of plants. Hopefully I can enjoy it for a few years now that it’s finally growing in, especially since so many European and New England gardeners are facing multiple boxwood problems … blight, caterpillars, ugh. The iris are at their peak. I should really evict them but never do. Seems like for every iris clump I remove a few new ones pop up. The compost usually brings in a few but the gardener also tends to feel bad for spare plants and ends up putting the innocent little fans in here and there. I don’t know what to say about this clump. Two years ago I dumped them here when I needed their real estate for a tomato planting. I never replanted them but apparently they don’t care. 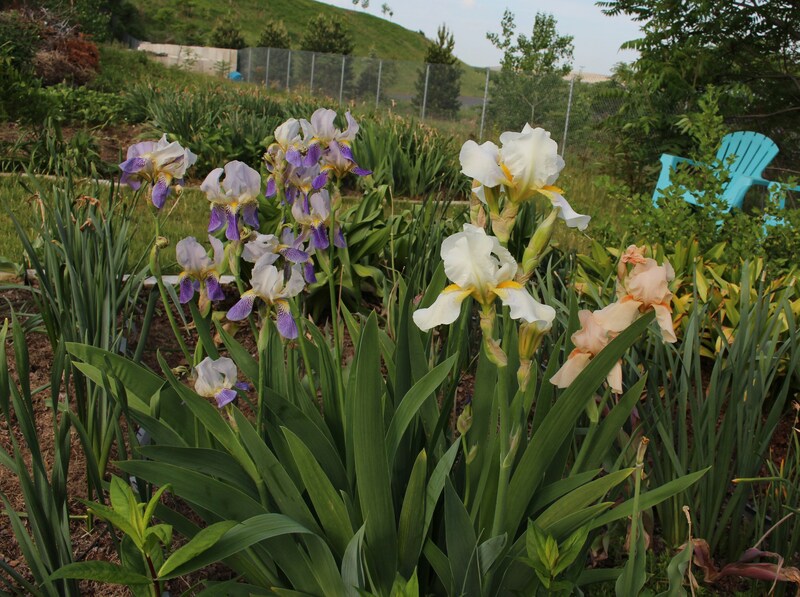 Two years in an iris bed with no bloom, two years of being tossed to the side and they look great. Go figure. Their identities are probably lost, but I think the apricot-pink to the right is ‘Jean Guymer’. It’s not all flowers, there are a few cool weather vegetables braving the up and down temperatures. Broccoli, lettuce, potatoes, and garlic all look promising, but here the tomato seedlings still all need to be weeded out. If I knew what they were I’d keep them, but I already have more than enough. They’ll stay for a few days longer to keep the ground covered since I don’t want mud splattering up into the yummy little lettuce rosettes when I water. Two favorite lettuces, the never bitter ‘Matina Sweet’ and the darker ‘Mervielle de Quatre Saisons’… which should get a delicious tender green heart in a few more days. The heat was too much for the arugula. The flowers are nice enough though, and I won’t mind weeding this one out for salads if it goes to seed. 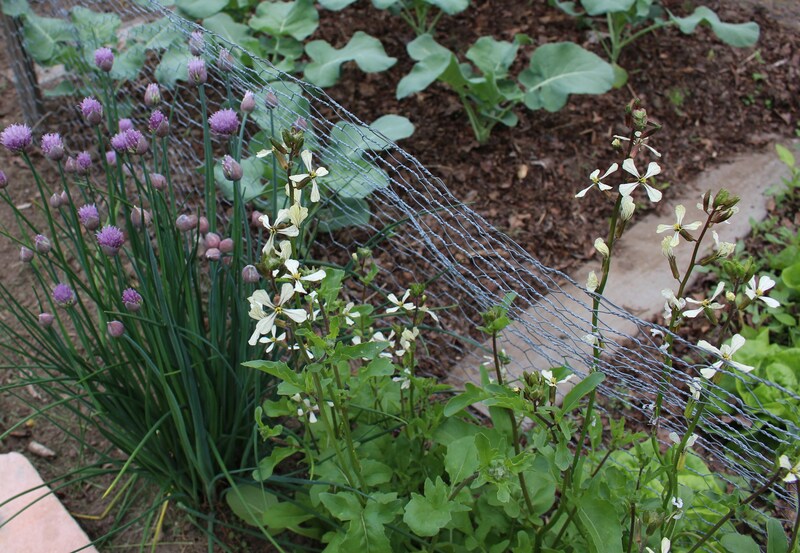 Chives in bloom and arugula bolting as the weather gets warm. Time to plant the summer crops! Even with the weeding and watering there’s still a ton to do. Some tulips and daffodils will hopefully start coming out this weekend and that should open up room for beans and squash. It may still be May but I’m going to say summer is here, and the next big project will be summer annuals. Even though the plantlets are anxious to get out from under the growlights, I hope to tackle one last big weed patch adjacent to the potager before all my energy is lost. It’s the on again off again red border/ pond bed, and hopefully in the next few weeks there will be some progress there as well. All kinds of weeds filling the red border. I resorted to roundup along the fence and that’s the only reason it’s not a sea of campanula glomerata. Wish me luck. We had a good rainstorm come through this afternoon and everything seems to be letting out a big sigh of relieve (including my water meter). Facing next week’s high temperatures with a still-dry garden was not something I was looking forward to, so I’m thrilled! 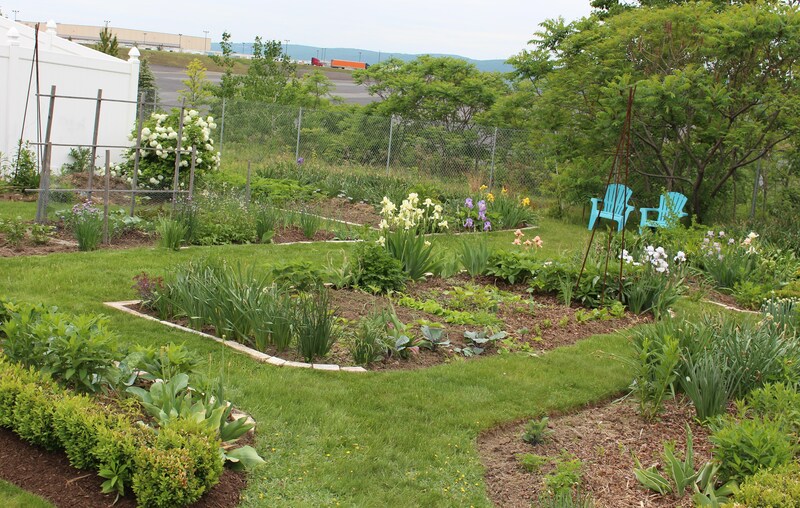 This entry was posted in garden, garden design, late spring, vegetable garden and tagged garden, gardening, Summer, vegetables. I’d call it a potager, after all it is only the French name for a vegetable plot that we imagine means something more ‘posh’. Anyway with a boxwood edge, it is certainly not just a plain veg plot! In summer you could try to sow some wild arugula (it has yellow flowers and deals with heat ad even a certain amount of drought. All looking good Frank, don’t give up yet! So that’s what the other arugula is! The first time I tried arugula it was pre-started plants but they were the fleshier ‘tame’ type, the second time I bought seed and was confused by the tiny seed and slow growing plants. I was actually a little wary about eating it because I wasn’t exactly sure what it was, but the taste was similar enough that I tried it anyway. This year I had seed for the ‘tame’ kind and that’s what I’m eating now…. but in the meantime the wild arugula has self sown into the driveway cracks and pops up in flower beds. I’m all for edible weeds, and I will eat more of it now that I know exactly what it is! thanks Matt, I do tend to get elaborate in my garden bed naming, so this wouldn’t be the first time I get carried away! Deep down inside I’m very provincial, but have airs to be urbane and chic at the same time! 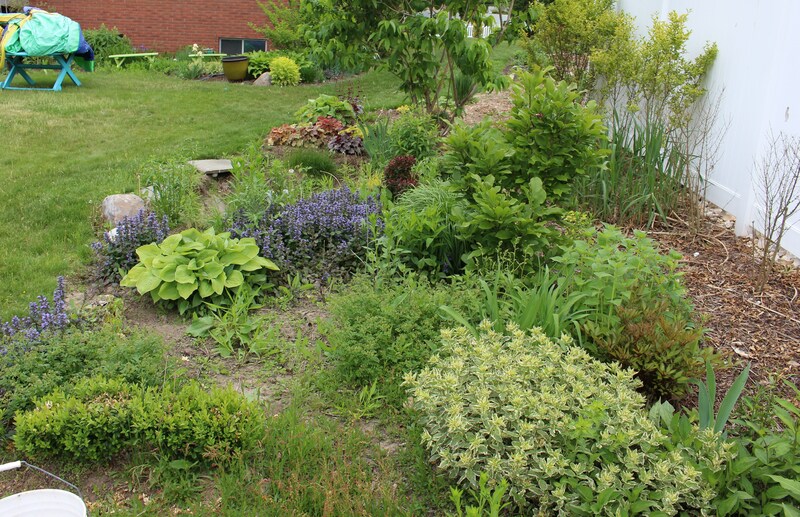 The garden just calls out to all real gardeners. So much going on! If you moved tomorrow, I am quite sure those iris would keep going til the next century, and the boxwood too. Thank you for the tour – I really enjoyed it!!! Thanks for stopping by Jane! I think you’re right, many of the iris are oldies that I picked up off the side of the street or were given to me by someone who had grown them for years, so they are tough! -I think it will be many years yet before we pick up and head south! I think your potager looks great! It’s already lush and I enjoy putting veggies and perennials (like iris) together to keep it from being a totally empty brown spot in between plantings. At least your nine-year-old helper didn’t haul out the Super Soaker for some moving-target practice on The Boss (this has happened to me)! The weather pattern seems to be going straight from your garden to mine, except that the promised storms took some detours and went to either the Jersey Shore or to Westchester yesterday instead. I was hoping for a downpour that would wash the latest deposit of tree poop from my car, but didn’t get it. Not a drop fell. They say we may get a storm later today but the sky doesn’t look promising for that. My parents are on Long Island and they’re playing the same game, dry, dry, dry. It gets old after a while and I hate to see it in May when everything should be exploding with buds and flowers. The rain we had yesterday helped a lot, but when I planted something this evening there were plenty of spots where the rain hadn’t even penetrated the mulch. My fingers are still crossed for a few more ‘scattered’ thunderstorms… it has helped hugely with the pollen and I hope you get your turn soon! Your box beds are beautiful. I like your crisp, mulched edging. I love the iris too, nice varieties. I sometimes think a nice edge makes even the worst lawn and garden look ten times better! I’ve only ever seen a few ‘not-so-pretty’ iris, the ones which annoy me are the lazy bloomers! I am very impressed with your potager and your neat box hedging. 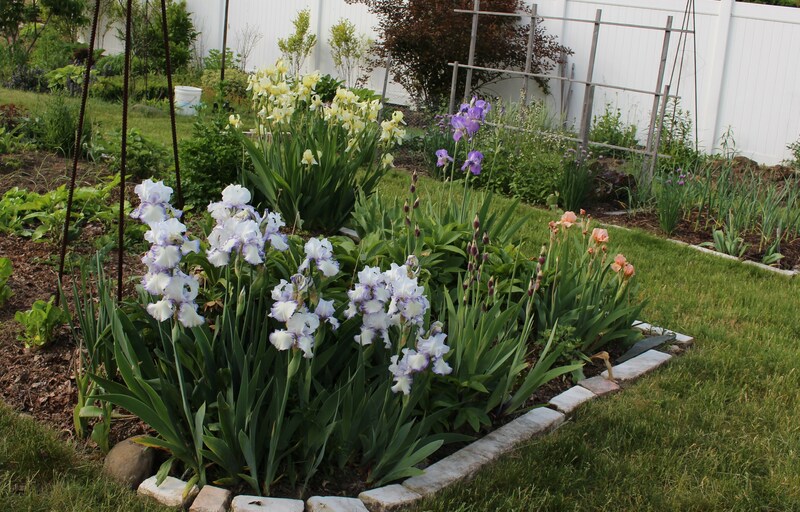 Please don’ t move the irises, they are gorgeous. Great to have a helper who is so handy with the secateurs. Perhaps you should introduce him to the spade. What fun he could have with that. Hmmm. The iris are awfully colorful, aren’t they? As long as I’m lifting a few daffodils I’m sure squeezing in a few iris into all those empty spots would do no harm at all. They could go between the tomatoes and barely take up any room! 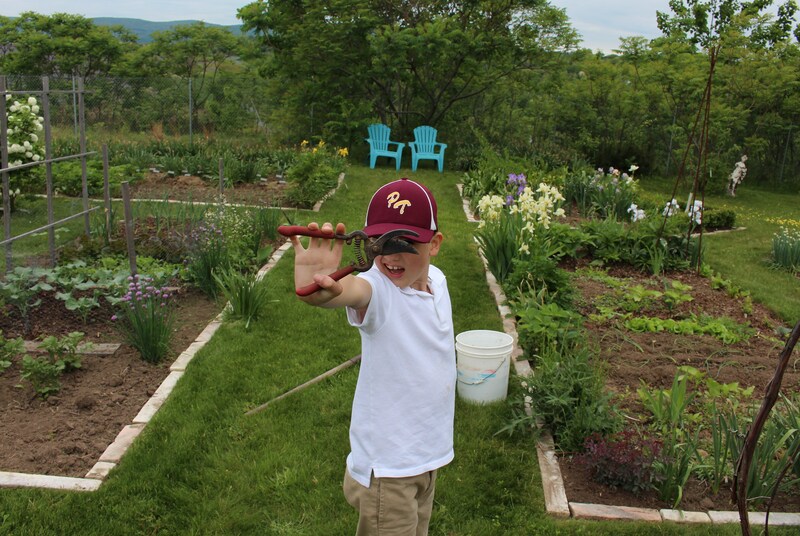 The boy does like the spade as well. I’m frequently left with mole hills here and there as he practices his technique. 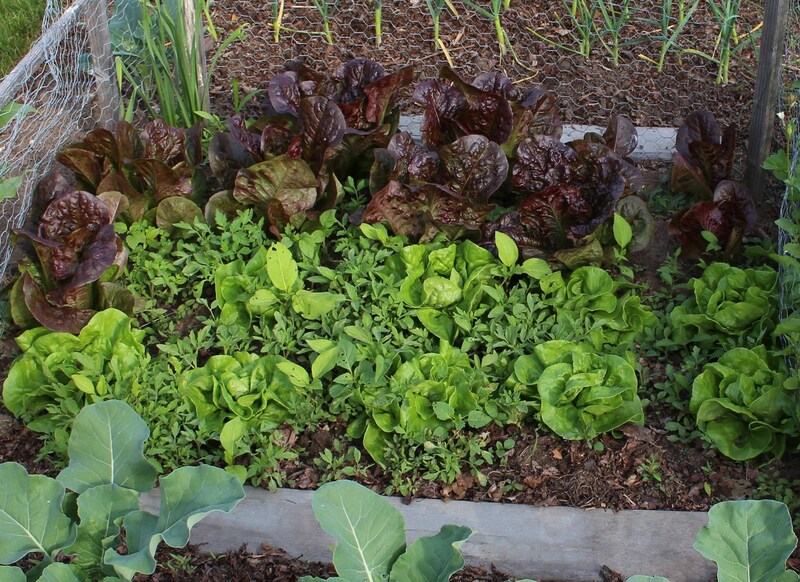 I love the box edging to your vegetable beds. It does have a continental feel to it so potager is a perfect name. Love the irises too. You have caught us up already – my chives are flowering now too! Ugh, caught up already? It just doesn’t seem fair that we waited and waited for spring and now it’s flown by so fast! If I could I’d like to line the back sides of the ‘potager’ with a short wooden fence to fully enclose the beds. One of these years when I’ve caught up on all the other projects, right? Oh yes, I can see in my mind a little woven willow fence… you’ll have to make it yourself of course, as you probably won’t find a good quality one the right size in the shops… something to do on a rainy day? LOL! There will be a fence some day and I’m stealing the woven willow idea! The twigs will likely be some other leftover prunings but close enough right? Looking fine! The boxwood hedge is a great touch. It looks great! Particularly those determined iris and the salad things you have coming on (if only mine looked as fresh!) I like to pretend to myself that box is not a cheap stand-in for stone walls … . I like the woven willow hurdle idea and I think it would look great with the style you’ve already got. I do like the look of willow, and frequently use twigs and branches as plant supports in the garden so this would be right up my alley! I saw on your latest post a pyramid of upright brush prunings with vines growing up. I hope you don’t mind me stealing that idea as well! Your lettuces look interesting. I will have to try to find ‘Matina Sweet’. I already grow and like Merveille des 4 saisons (but my favorite is Kagraner Sommer – if you ever see it, try it). As for potager, it comes from potage which means soup or vegetables for the pot. So you could say a potager is a patch where you grow your soup veges – certainly not too sophisticated a name for your attractive beds! I risk losing the chic if I start explaining the ‘vegetables for the pot’ connection, much better to offhandedly refer to it as the potager and hope none of my monolingual friends are any the wiser! But I do thank you for the education, and after thinking about it and looking up some more language background I was surprised by just how many English words owe their birth to the French language…. some sites placed it at around 25%! I will try Kagraner Sommer, I’ve seen it offered but have never tried it. I’m loving the rain and the cooler weather. Just a few days ago I had given up on any more transplanting and dividing, now my second chance is here! You’re not alone with the weeds. My mother always says they’re easier to pull when they get a little bigger, but I don’t think this is what she had in mind. You’re potager looks great, not messy at all. Wonderful Irises! Have you considered growing vines on that chain link fence? As for helpers, in my experience kids want to help up until the age of five, during which time they make every task more challenging. After that don’t expect any willing assistance until age 20 or so, at which point they can be very helpful during those times when they are visiting the old homestead. So I have quite a wait ahead of me then. Better get weeding! I’ve tried a few grapes on the chainlink but it being just out of reach of the water hose means 2 out of 3 plantings have failed due to drought. I’m back and forth between covering it and possibly making it more obvious a fence is there, and leaving it alone and hoping it ‘disappears’ amongst the tree and shrub foliage of summer. I hope your seeds will sprout this weekend, the forecast looks warmer and although I do like a cool spell, this one could use a little more sunshine. Plus I started pepper planting, and they’ll need the heat!